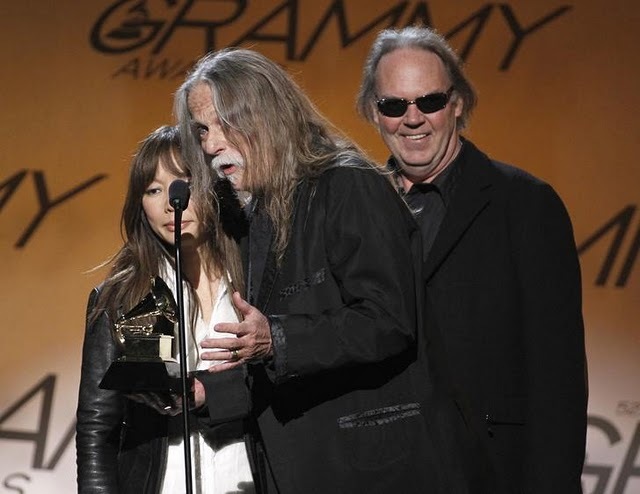 "Best Art Direction on a Boxed or Special Limited Edition Package"
During Neil Young's 50+ years recording career, he has been awarded only a single Grammy Award in a musical category. Zero Grammys for Buffalo Springfield or Crosby Stills Nash and Young. 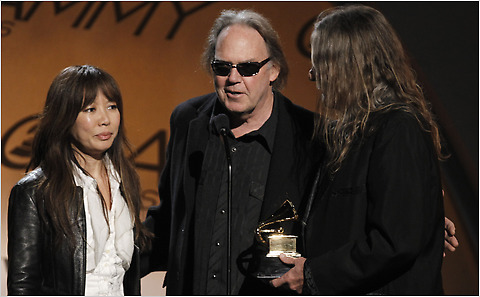 Neil Young's first Grammy nomination did not come until 1989, for the video for “This Note’s For You”. So just remember that tonight while watching the Grammy Awards. Oh come on, people, they deserve the award for such great art direction. The artistry is awesome. I agree that Neil deserves a Grammy for his music, and doesn't get half the overall recognition he deserves, but that shouldn't take anything away from the artists who did such a fine job creating the packaging for the Archives. What y'all need to understand is that mainstream people in our society and the music industry aren't looking for creativity or the quality of personal expression, or your ability to channel the universe in music. They are much more shallow than that. The people want what's sold to them, they want to be part of the popular crowd, they aren't interested in identifying personally with a song in a profound, emotional way. They far outnumber the people who enjoy music because it moves them or titillates their minds, because of how it effects them personally, both emotionally and intellectually. The music industry, by-and-large, plays to this tendency. It releases shallow garbage, people buy it and pretend they like it in order to satisfy their need to be accepted. This is mainstream American pop culture we're talking about here, not the land of smart, thoughtful, multidimensional individuals. So obviously the chances of Neil Young winning a Grammy are much, much slimmer than Taylor Swift, even though he writes better music. Neil writes better music than almost anyone. It's not about good music - it's about popularity. It's about who sold the most albums because they were aggressively marketed by the industry to the shallow mainstream cult of popularity. I'd be happy if Neil Young did get the recognition he deserved, but Neil isn't after recognition (thank GOD, because his music wouldn't be half as good as it is), and he doesn't need it, so who really cares? In some sense it might even be a travesty to award him a Grammy, considering that winning one basically indicates that you're simplistic and derivative enough to easily market to sheep. More on Gary Burden Receives Grammy Nomination for NYA Design. Also, Gary Burden’s blog has fascinating entries about this project with respect to design, sustainability and collaboration. 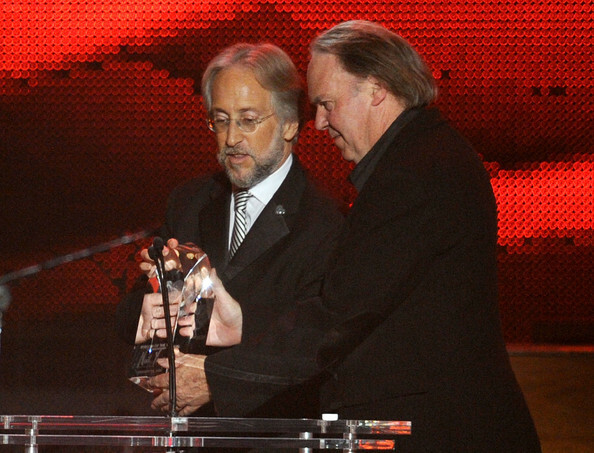 Also, see Neil Young Honored As MusiCares Person Of The Year. Some very exciting news last week! Did I mention I love Neil Young and Crazy Horse? I hope Alchemy includes the Plenary version of Ramada Inn, possibly one of the most exciting live Crazy Horse performances in recent times, featuring some fantastic lead guitar from Neil (a show that only currently circulates in passable bootleg quality). Voodoo fest 2012 was also notable, with a great pro-shot video and a very soulful performance. Whereas the on-the-verge-of-collapse London 2013 version was thrilling in a very different way; typical Crazy Horse. So I'm really looking forward to both upcoming releases. I haven't had so much time to write recently (to some folks' delight, I'm sure), so I hope everyone is well and having a good year so far. I've been enjoying listening to The Vistor. I also wanted to talk a bit about headphones. With all the hype about audio resolution, something far more important gets left behind: what you are actually listening on. Headphones (and speakers) come in all sorts of sonic colours, and will have a very dramatic effect on how you perceive the music. Recently I've been listening mainly on my Sennheiser HD600 and Sony MDR1000x headphones. Both are high quality and very heartily recommended. The Sennheisers if you want a very clear, pleasant and natural sound and the Sonys if you want something still detailed but a bit more "fun" with a punchier bass and slightly more present treble. And as a bonus for fans of the placebo effect, the Sony's upscale lower-res files to the point where Sony's top sound engineers from Japan (big supporters of hi-res audio) can no longer map on a graph or hear the difference between them and their hi-res counterparts. Personally I'm a critic of high-res audio, but if you do believe in it (as Neil does), then you may ask yourself what actual point there is in buying hi-res files when the technology is already widely and inexpensively available to upgrade lower res files to hi-res (crucially, even those not recorded in hi-res in the first place). Regardless, the headphones sound fantastic and if you are still listening on cheap ear buds, perhaps it's time to consider an upgrade. I'm looking forward to subscribing to the archives. A word of wisdom to Neil's management: be generous. This project is tenuous and hanging in the balance, it could be great; but any stinginess will leave you with nothing. This is 2018, and as you are well aware, not the golden age of record sales. You have to be careful, and the way to do that is the opposite of your instinct to withhold; keep your promises. Be generous. And don't make the audio resolution seem more important than the music itself. That’s another reason why the Grammys r a waste of time and not the penultimate of the music world!!! Good to hear from you Scotsman! Happy New Year. And right, much to look fwd to here in 2018. Also, thanks for the headphone tips. We probably could use a new pair as our old pair's ear cushions have just about worn out. Hope to see you back this way soon. btw, there are a bunch of threads on new Archives stuff, so maybe check those. This Grammy thread is rather beat, wouldn't you say?